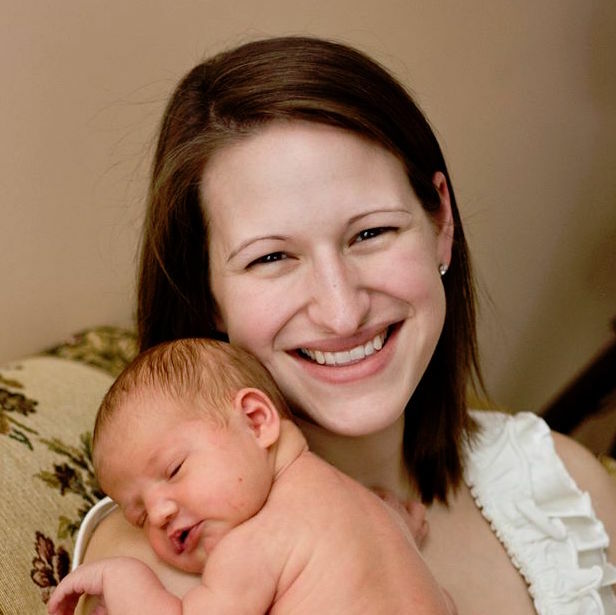 As a homeschooling mom and aspiring entrepreneur, my life is nothing short of a daily race to the finish line. If wearing shoes was my thing (which for this farm girl it definitely isn’t), I would wear my sneakers to bed, just to be ready to hit the ground running in the morning! Since I’m being honest with you, the last thing I need when I come downstairs in the morning is to wake up to a messy kitchen, toys scattered throughout the living room, and paper clutter mounted high on our countertops. Perhaps you can relate. Some weeks are just a little more overwhelming than others. Whether you have children in school or at home, there are daily demands that can easily distract us from successfully keeping a tidy home. Lessons, extracurricular activities, hobbies, and sometimes just a night of relaxing on the couch – it all adds to our daily schedule and I often wonder how my home has suddenly erupted in clutter and chaos! If you are anything like me, you most likely thrive when your home feels fresh, looks tidy, and is ready to welcome guests at a moment’s notice. So how can we achieve this? Is it really possible to maintain a busy, joy-filled lifestyle, while still enjoying a tidy home? I truly believe that it is. Over several years of trial and error, and many unfortunate mornings of waking up to a sink full of dirty dishes, I have adopted FIVE EASY TIPS to maintaining order amongst the chaos. I finally dropped my cleaning schedule into the garbage and decided: If it looks dirty, I will clean it! This week, I’ve noticed that my white kitchen cupboards are becoming a little grungy. So on my to do list is “clean kitchen cupboards.” The upstairs bath is in need of a deeper clean than usual, so I will tackle that as well. The downstairs bath – well, that will get a quick wipe down. It’s looking pretty good this week! Next week I’ll probably tackle our windows. Summer is just around the corner and they could use a little sparkle. 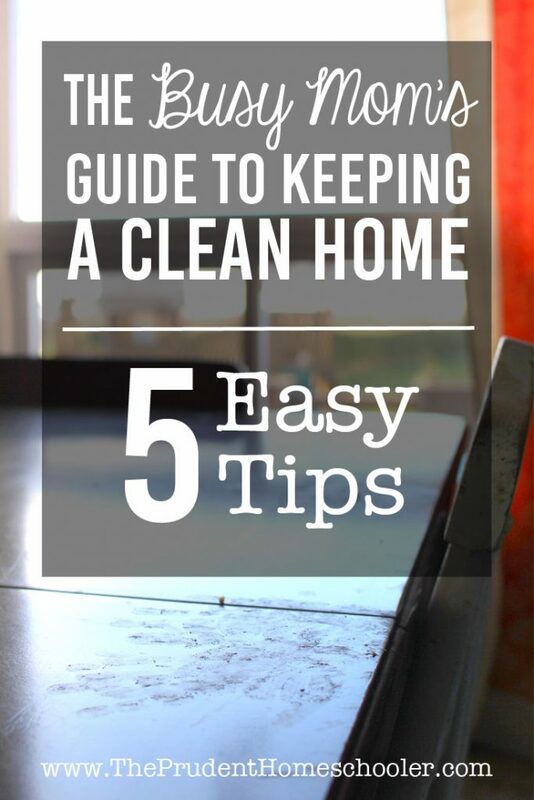 Do not over think your cleaning schedule! Cut yourself some slack. If it looks dirty, clean it. This one idea has revolutionized my life! As part of our goal to pay off debt (including our mortgage), we line dry EVERYTHING, either outside in the summer, or in the basement in the winter. Since we do a load of laundry every single day, I was able to calculate that I save approximately $1 daily by hanging our clothes (and cloth diapers) to dry. By washing, drying, folding, and putting away one load each day, the job is simple! Even with currently five people in our family, folding takes a mere 10-15 minutes each day (exactly 10 minutes yesterday afternoon). I can find 10-15 minutes each day to maintain order, and I’m sure you can too. 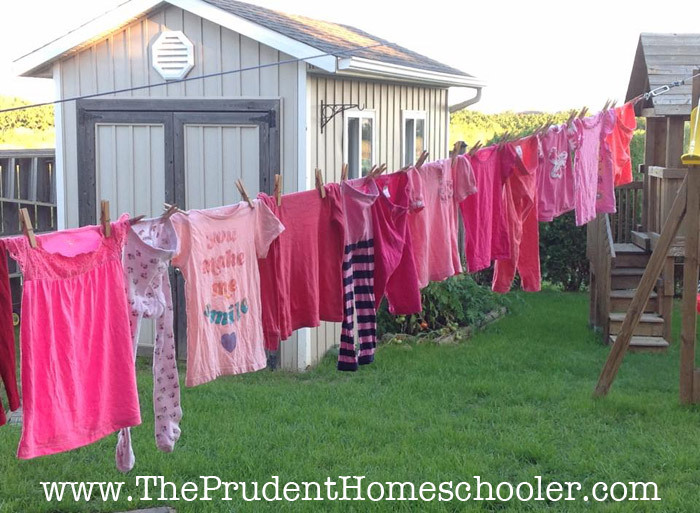 While it is a habit that must be formed, completely finishing one load of laundry each day is a sanity saver in our home. Integrate simple organizational systems into your life: a cute box for blocks, a basket for dolls and stuffies, a bin for trucks and cars. Now, do your best to keep all of the toys corralled into one area. We store our most-loved toys upstairs near our dining room. The kids enjoy playing with me and near me, so I seldom ship them downstairs to the basement. Now that your toys are sorted, take some time to intentionally clean WITH your children. Show them where each type of toy belongs. Years ago, with one child, my bins were perfectly labeled. Today I don’t even bother! 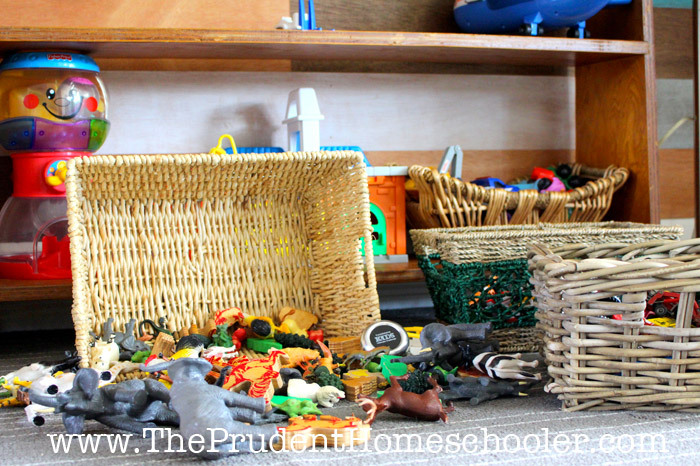 Our children can easily see what is inside each of our baskets, and after a week of cleaning with them, I can easily ask them to tidy up on their own. It is nothing short of magical watching a 3 and 5-year-old tidy, to perfection, an entire room of toys! We are also currently implementing a ‘rule’ that we tidy up the toys before going to bed. Any fantastic structures that were built throughout the day are photographed for documentation, and then put away for a new day of play. Organize your toys. Teach your kids to clean up. And then release the responsibility on to them. You will thank me in the long run! This idea translates into: before you leave a room, do a quick tidy. 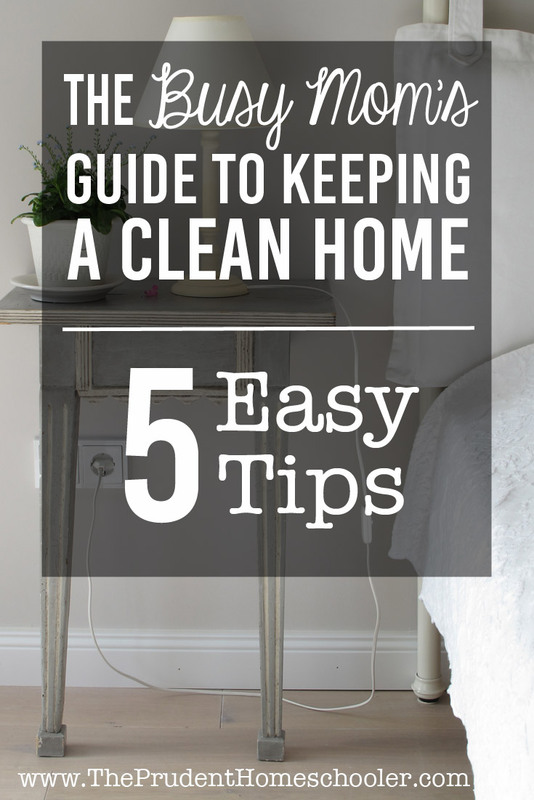 Do you ever have that terrible feeling where your home feels so disorganized that you cannot breathe? I definitely do, and then it leads to frustration in homeschooling, laziness in accomplishing other tasks, and an overall feeling of overwhelm! These days I take 30-60 seconds to tidy up a room before I leave. Cushions might need to be put back onto the couch. The ottoman is pushed back into place. If there is a toy, book, or other item that belongs in another room, I take it with me and return it to its home. 30-60 seconds at once is not overwhelming; however, when done several times throughout the day, these seconds quickly add up, and you will notice how your home suddenly begins to take shape and feel lighter. Embrace the 60-second tidy. As it becomes routine, your space will easily be refreshed throughout the day, as will your attitude. At the end of the day, do yourself a favour and finish those dishes. I have noticed that some days it only takes ten minutes. Even at 11:30 at night, those ten minutes will change my entire morning the next day. Rather than washing dishes while a hungry, wailing toddler wraps himself around my leg, I can get right to making breakfast. 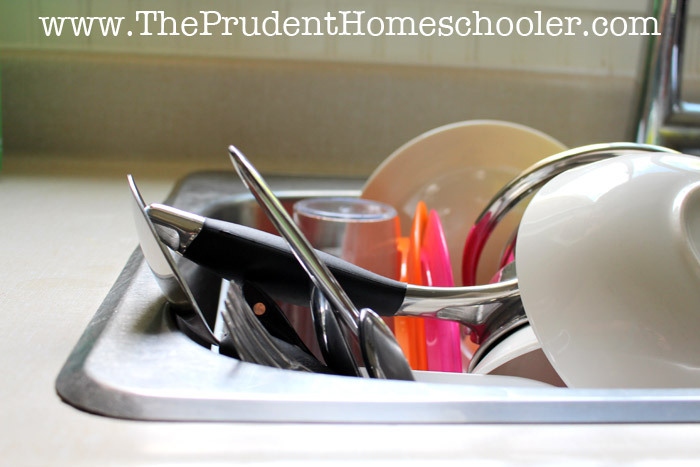 Even if the dishes sit to dry in the sink overnight (I personally do not have a working dishwasher – this is my reality), or you start a load of dishes to be put away in the morning, you will at least wake up to sparkling countertops! Imagine that glorious feeling you experience when you walk into a clean kitchen in the morning. Embrace that feeling and strive to create it every day. It sets a mood for your day that is easy to fall in love with. Finish all dishes and wipe your countertops clean. Five EASY steps to maintaining order even when life is busy. If it looks dirty, clean it! Complete one load of laundry each day. Teach your children to clean up after themselves. Do YOU have a favourite system for maintaining order in your home? I really enjoy the sanity saver act of gathering up all the dirty towels, rags and clothes once a day and bringing them to the laundry room. That is a great idea! Since our laundry room is right off of our kitchen, I can easily toss dirty kitchen cloths into the wash as needed. And we don’t even bother with laundry baskets – I do the same as you: bring laundry down once a day so that nothing piles up. Thank you for sharing!